When my student Sophie* entered my classroom the first day of the 2015-16 school year, she believed that she could not do math. She would panic every time a new skill was introduced because she was convinced she wasn’t going to get it. After months of working together, Sophie* left my classroom with a new outlook on math. She learned to practice growth mindset and to embrace mistakes. She now enjoys math and embraces the learning process. We all have had students like this. These students are convinced that, no matter what, they will always be bad at math. It is extremely difficult to shift these deep-rooted anxieties and fears. However, after many years implementing growth mindset in my classroom, I have found a way to make a lasting impact on my students. Here are the steps I take to transform my students’ math mindsets. Shifting students’ mindsets does not happen overnight. That’s why I make time to talk growth mindset every day. I use time during community circles and before dismissal to talk with the whole group. I also make an effort to notice when students are struggling so I can talk with them individually. I start at the beginning of the year by introducing growth mindset and the brain research behind it. The With Math I Can website has a number of helpful resources for this. Then, my students and I talk about famous failures and the definition of grit. Too often, students believe they should understand new concepts immediately. We must shift this belief and instill in them that they don’t have to "get" things right away. When students are frustrated with new concepts, I like to ask the question, “How long have you been working on this?” I remind them to add the word “yet” and encourage them to use language such as “I don’t understand yet, and that is ok.” Teaching them this tactic will allow them to manage stress associated with uncertainty and focus instead on learning the new concept. Related to the power of “yet” is encouraging students to not compare their learning to other students. I am constantly reminding my students that everyone learns at a different pace and that this is okay because everyone will eventually get there. One way that I illustrate this concept is through an exercise I do at community meetings. I hand out note cards to every student that assigns them a hypothetical injury, such as a bloody nose, scraped knee, or a broken leg. I tell the students to pretend that I am their doctor. Then, I ask each student what is wrong. When they tell me their diagnosis that they received on their card, I respond to each student with the same thing: Take two aspirins and call me in the morning. After the exercise, I ask them about what they noticed. Most of the time, students would say they noticed that, even though they all had different injuries, the doctor prescribed the same medicine. I ask them to tell me how this is like learning. We talk about how all students join our class with different strengths and weaknesses and that we all learn differently. Trying to compare ourselves to other students is like a doctor trying to treat us all the same way. I revert back to this doctor exercise throughout the school year to help students when they need a concrete reminder of this concept. I make a point not to look at grades with my students and, instead, focus on growth over time. 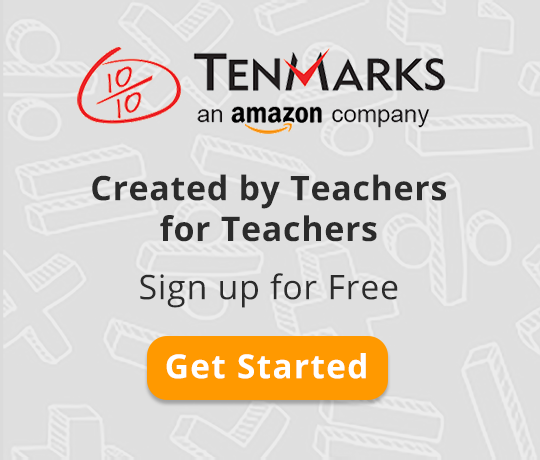 It is helpful to look at the growth in TenMarks Math assignments for particular standards. The assignment reports show growth in a way that helps students visualize their growth. We talk about how they felt the first time they tried to do a problem for a certain standard and then we talk about how much they have grown since. TenMarks Math makes it easy for students to put growth mindset into practice. Most impactful are the real-time interventions called Amplifiers. I tell my students that, when they get an Amplifier, they have an opportunity to learn from their mistakes and try again. Overwhelmingly, Amplifiers result in an increase in their score. As a result, this practice reveals to students that, when they embrace mistakes and persist through difficult practice, they learn and grow. I like that TenMarks Math assignments also have the option to provide instant feedback so students can learn from their mistakes when they make them and apply what they learn going forward. Finally, embedded supports like hints and videos demonstrate to students that we all need different things to learn, and that is ok. It is a great way for students to get help they need when the teacher isn’t there. One of the most gratifying parts of my job is to transform these deep-rooted fears about math and to make a lasting impact in the way my students approach challenges going forward. Do you have other strategies to transform students’ math mindsets? Share with our community below. Susan Preston is a 4th grade teacher in Menlo Park California and an Amazon Education Fellow. In addition to being passionate about teaching math, science and growth mindset, she loves to swim and compete in open water swims as well as spend time with her two children, Sarah and Cole, and the family's two German Shepherds, Blake and Jayne.